How spouses support one another may be important in understanding and preventing marital distress, but has received relatively little attention. Instead, the behavioral model of marriage and corresponding treatment protocols have focused on the importance of good conflict management skills in preventing and treating marital distress. This paper outlines recent research indicating that couples social support skills predict marital outcome two years later, above and beyond conflict management skills. These results indicate that successful prevention and treatment programs may need to incorporate support skills training as well as conflict management training. Practical implications of this research are outlined, and specific techniques are recommended for teaching social support skills to couples. Sullivan, K.T., Pasch, L.A., Eldridge, K.A., & Bradbury, T.N. (1998). 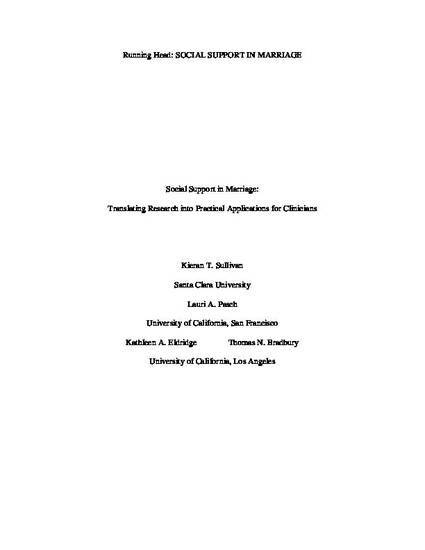 Social support in marriage: Translating research into practical applications for clinicians. The Family Journal, 6, 263-271.